The NG911 Clearinghouse is a NG911 Standards compliant service, that includes a LIS and ADR that meets i3 and IETF (Internet Engineering Task Force) standards, that is accessible to authorized PSAPs through integrations into all major call-taking equipment, mapping software, and CAD products. The NG911 Clearinghouse receives data from the Internet of Things (smartphones, connected cars, wearables, and connected homes) and securely sends the relevant data to 9-1-1 and first responders. Download the free NG911 Clearinghouse solution overview to learn more. Where does the NG911 Clearinghouse data come from? RapidSOS has partnerships with various connected device companies (wearables, connected car, connected home, smartphones). In an emergency, precise location and rich data (when available) is transmitted to the NG911 Clearinghouse from enabled devices. Example data sources include Apple, Uber, and Waze – and there's many more to be announced (stay up-to-date on all announcements by subscribing to our blog). Why do I need location from the NG911 Clearinghouse if I already get it from the Wireless Carrier? The NG911 Clearinghouse provides PSAPs with supplemental device-based location information in addition to the ALI Phase 1 and Phase 2 location information. Citizens often ask, “Why can Uber find me but 9-1-1 can’t?” Apps like Uber locate users based on device-based location, whereas 9-1-1 today still uses a network-centric approach that often falls back to cell-tower triangulation when a GPS fix cannot be obtained. Device-based location, available to PSAPs through the NG911 Clearinghouse, combines all of the sensors on a smartphone. In comparative location testing, device-based location has shown to be faster and more accurate than traditional network-based location mechanisms. Data from comparative location testing done at Hamilton County 911 in April 2018. Full report available for download here. Even if/when Wireless Carriers start processing device-based location, outdated delivery mechanisms like ALI typically introduce a delay and risk for inconsistencies. In the old paradigm of Phase 1 and Phase 2 information, call-takers need to manually re-bid for a more accurate location without knowing when exactly it'll be available. Delivering location through the NG911 Clearinghouse makes the most accurate location information available to the call-takers automatically, without a need to request it through a system that is slow and unreliable. Is the NG911 Clearinghouse an over-the-top application? No. The NG911 Clearinghouse integrates directly with existing PSAP call-taking, dispatch, and mapping software systems. Our full list of integration partners can be found here. 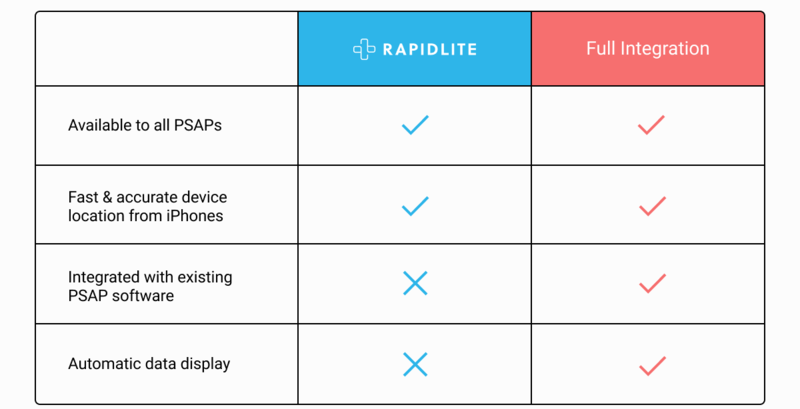 RapidSOS provides a free web-browser solution, RapidLite, as an intermediary solution while PSAPs explore the full integration with their software vendors. Is the NG911 Clearinghouse a replacement for the ALI? Does the NG911 Clearinghouse cost money? RapidSOS does not charge public safety to receive access to the NG911 Clearinghouse. There may be a small software cost through the PSAP software vendor. Any PSAP can receive 100% free access to the NG911 Clearinghouse via RapidLite today. RapidLite is a simple, secure and easily accessible tool to retrieve location information from the RapidSOS NG911 Clearinghouse. Once a PSAP Administrator successfully sets up an account, PSAP staff can simply enter a call back number for a 9-1-1 caller and RapidLite will return location information when available in the NG911 Clearinghouse. RapidLite allows every agency to access data from the NG911 Clearinghouse, regardless of the compatibility of existing software. Any authorized PSAP can sign up for RapidLite today, for free. Next Generation 911 (NG911) is a term that is often used for the migration of a copper-wire based legacy telephony system to a more robust, Internet Protocol (IP)-based platform that will allow voice calls, texts, location information and more to be transmitted in a more reliable, scalable and robust manner. Most features of the RapidSOS NG911 Clearinghouse do not require a full NG911 network deployment. The only requirement other than an ability to display Clearinghouse data is a secure robust IP connection from the PSAP to the Clearinghouse. If NG911 is a data superhighway, RapidSOS is the data that travels on it. What are PSAPs saying about the NG911 Clearinghouse? Still have questions? Fill out this form and a member of our public safety team will reach out to set up a meeting one-on-one. Ready to get access to the Clearinghouse for your PSAP? Request access now.